To get the approval by the "Boss", and furthermore to get the approval by "Boss of the Boss". I have introduced you the method of two-step approval in "How to Design a Workflow Chart of decision making by the Boss and Their Boss". An approval flow that is probable also other than decision making. This time, I would like to introduce you another way of drawing on the Business flow of the last week. In the Workflow chart below, the second Swimlane is set "Boss of the Requester" (relative specification), not "Manager" (absolute specification by the positions). By this setting, the Task of [2. Approval] will be allocated to the Boss of the organization that the Requester belongs. That is, in a Organization of "two Directors (officer), ten Managers, fifty Members", if "a Member" requests for approval, a Manager will approve it. If a Manager requests for approval, a Director will approve it. One President, two Directors (officer), ten Managers, fifty members. It is indeed probable organizational structure. People who belong directly to the Departmentｓ that two Directors supervise each, is "2 times 5". People who belong to 'Team' that Ten Managers supervise, is "10 times 4". A 'Team' itself belongs to a Department, of course. More specifically, a case that some Teams are affiliated to the Sales Department, and the Sales Director itself leads directly five members on administration work, and some Teams are affiliated to the Manufacturing Department, and the Manufacturing Director itself leads directly five members on quality control work. Characteristic of this organizational structure is that it has a "scatter in depth." It is really probable. Well, in such case of "Organization with a variation in depth", how should the Approval Request flow be described in Workflow chart? 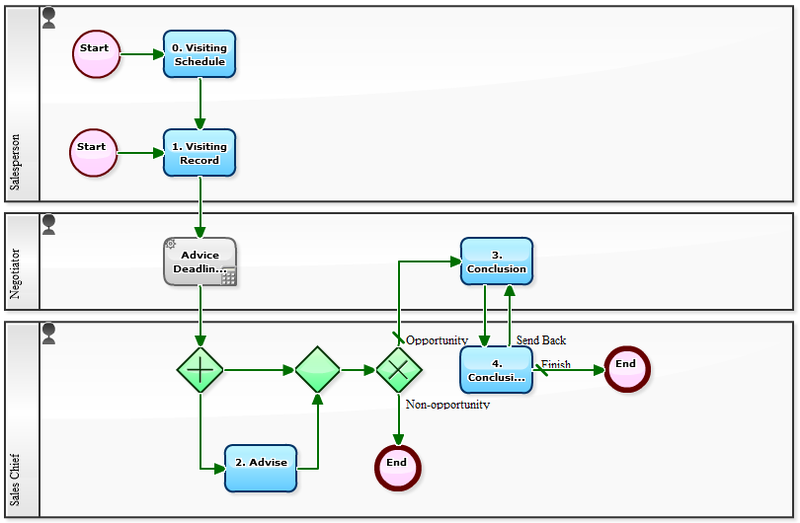 We would like to think of how to write in accordance with international standard notation BPMN. The most controversial point is how to describe the in-house rule that "as a general rule, with the approval by Manager, Director will make the final decision". That is, there is no Manager for the "2 times 5" in this Organization. Activity Report of Route Sales is a "Business Flow"! How to Write it? Sales activities are what "The source of earning" of a company. Those Sales activities are simply categorized into sales against (a) "new customer" and (b) "sales against existing customer". Sales activity for (a) is sometimes called "walk-in sales" or "Cold calling and visit", and also sales activity for (b) is sometimes called "route sales". The following Workflow chart represents daily business reports for "route sales". The important point is, it is in serial report type, not in daily report type. This can be used by in a wide variety of industries such as building materials, food and beverage products, temporary staffing services. 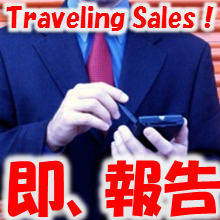 After the visit, "the salesperson" inputs the visit record mostly with a Smartphone. That is, to select visited company name, and to record about 'products that is inquired about (occurrence of a topic)' or 'product that requested a quote (occurrence of opportunity)', etc.. If the most of sales member have a "habit to report immediately after the visit", naturally the number of visits will be visualized in real time. Speaking in supervisor's point of view, performance status of marketing strategy (the situation of the fight) will be able to understand in detail. By analyzing the visit record and contracts record occasionally, the ideal situation about staffing and a new sales strategy, would also come into view. With Cloud, Leave Request at Any Time from Smartphone! There are many types of "off". Request for "leave" is an important application that concerns to salary, but in the other hand it is troublesome that you have to read-back "the work rules" or to look for the format of the "application". You want to make it smoother. 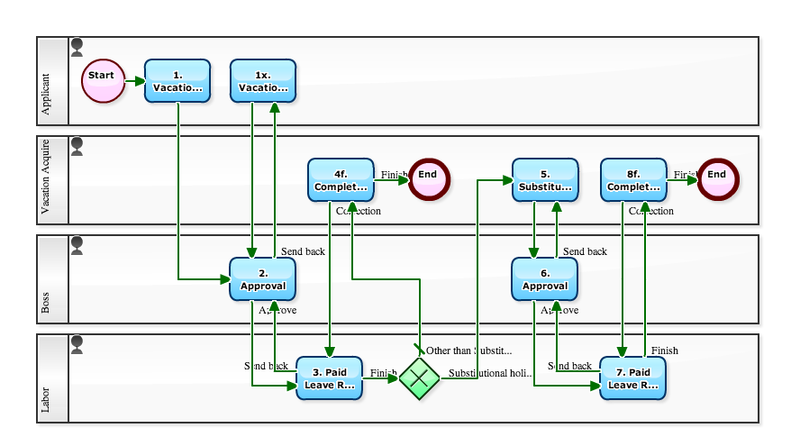 The following Workflow is "Leave Request flow" which can be used by a lot of companies. You do not have to care such as "difference between annual leave and special leave" or "difference between compensatory day off and Substitute holiday". Except the "obvious holidays" like Saturday and Sunday, you can freely request for leave of vacation. Furthermore, every time you see the screen of application, you can learn that "Oh yeah, I can also make request from here when I request parental leave".